Orwell turned a mundane office into a torture chamber where we are locked up with whatever we most dread. Rachel Whiteread’s plaster-cast of the room’s interior before it was torn down turns it into a sinister, impenetrable bunker, bearing the scars of years of human activity for those who care to look closely. The work is central to the Tate Britain’s display of three decades of Whiteread’s sculpture, which seems to take a god-like, dispassionate view of the traces we leave. As much as any medieval skull and crossbones, it is a memento mori and yet Whiteread also manages to be uplifting, especially when we get the chance to see her works collected together rather than in isolation: her restraint is admirable; she gives us colour and occasional humour as well as absence of life; she strains our imagination and she balances the monumental with the intimate. When not capturing the spirit of buildings before they are knocked down, Whiteread is busy exploring the insides of hot water bottles and enema bottles in her series of “torsos” cast in cold white plaster, wax or pink, dental plaster. Instead of being comforting or curative, they have become “headless, limbless babies,” to use Whiteread’s own words. She also repeatedly visits doors and windows from behind, so they trap rather than admit us and mattresses are not for sinking into, but for staring up at from the floor beneath the bed or for looking down on as they slump discarded and uninviting in a street. The most sinister doors of Whiteread’s career are those on the Judenplatz Holocaust Memorial in Vienna, conceived as an inside-out, windowless library. The countless books, with their spines facing inwards, are unreadable and title-less, like the untold stories of the countless victims, while the massive double doors imply imprisonment, not access. It’s a deliberately stark contrast to the bustling cafes and elegant imperial buildings of the square where it stands. The Tate Britain exhibition can only show us the Holocaust Memorial in a gallery of photographs of Whiteread’s international works, but it makes us feel the need to appreciate its high seriousness first-hand. We might also be inspired to head off to east London to see the Whitechapel Art Gallery, where Whiteread’s frieze of gold-coated leaves on the facade is uncharacteristically pretty. 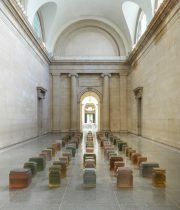 More immediate light relief is at hand in the Tate Britain’s airy, patrician Duveen Galleries – host to Untitled (One Hundred Spaces), comprising coloured resin casts of the underside of chairs. The solidified air bears the cumulative imprint of all who sat on them. Outside the museum itself, we find the concrete cast of the inside of a Chicken Shed, strangely clammed up and dwarfed by the architecture of the Tate Britain. It recalls the concrete sheds sited in remote landscapes, which Whiteread refers to as her “shy sculptures”, tucked away, waiting for passing visitors to come upon them and reflect on the impact that lingers when we have gone. London Grip Poetry Review – Linnell	Alessandro Blasetti and the Neorealists: A Review of 1860. By Jane McChrystal.